This is an adapted recipe from Ina Garten. The herbs add flavor and the lemon gives it freshness. I added Dijon mustard and lemon zest to her original recipe. I also added the roasted lemons and squeeze the juice over the cooked salmon. Roasted sweet lemon is delicious. 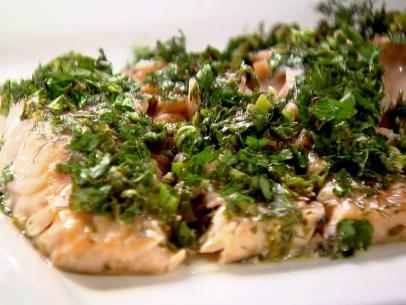 Place the salmon fillet in an oven-proof dish and season it generously with salt and pepper. Whisk together the Dijon mustard, olive oil and lemon juice and drizzle the mixture evenly over the salmon. Let it stand at room temperature for 15 minutes. In a small bowl, stir together the scallions, dill, and parsley. Scatter the herb mixture over the salmon fillet. Sprinkle the lemon zest all over the herbs. Pour the wine around the fish fillet. Dip the cut lemon (each half) in the sugar. Place in the pan next to the fish. Roast the salmon for 10 to 12 minutes, until almost cooked in the center at the thickest part. The center will be firm with just a line of uncooked salmon in the very center. (I peek by inserting the tip of a small knife.) Cover the dish tightly with aluminum foil and allow to rest for 10 minutes. Cut the salmon crosswise into serving pieces and serve hot with squeezed sugared lemon on top. Is Dijon mustard kosher for Passover? There is a kosher for Passover version, its isnt great but works, I use slightly less. It is basically horseradish and vinegar and a really gross food coloring, but it works in marinades and salad dressings.